Karma is a white and grey Siberian Husky who is 11 years old. She came to us from a previous home and is now looking for her new loving home! Karma can be a little shy at first, but once she warms up she'll quickly show you her playful and friendly personality. This bouncy girl loves running around outside, knows a bunch of basic commands, and is said to do well with other dogs and kids! 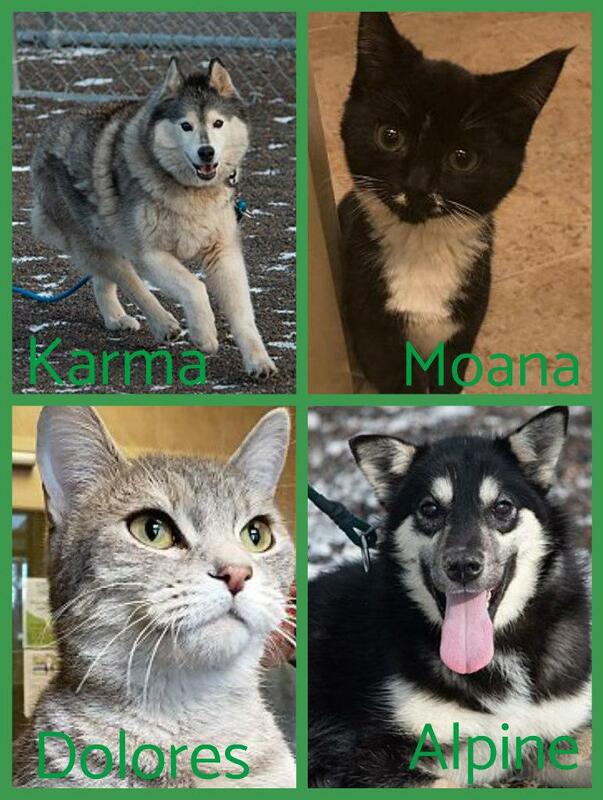 Karma is available for adoption through Animal Allies Humane Society. Moana is a black and white, eleven week old kitten ready to find her new home! You can visit Moana at Animal Allies Humane Society. Dolores is a grey tabby Domestic shorthair who is 3 years old. She came to us as a stray from Duluth and is now looking for her new loving home! Dolores is regal and curious! She likes to investigate everything going on. She will find nice place to perch and watch the world around her. Dolores is available for adoption through Animal Allies Humane Society. Alpine is a seven month old Siberian Husky mix. As you can tell he is smiley and eager to find his new loving home. Visit Alpine at Animal Allies Humane Society. Brady is a four year old Mastiff who was given up by a loving family. He is well trained, smart, and very well taken care of. He is a gentle giant! Visit Brady at Contented Critters Animal Sanctuary. Goldfinger is an orange tabby domestic short hair who is six years old. He came to us as a stray from Carlton County and is now looking for his new loving home! This gentle, loving, young lad could be the one for you! He loves to snuggle and purrs like an engine. Goldfinger is available for adoption from Animal Allies Humane Society.